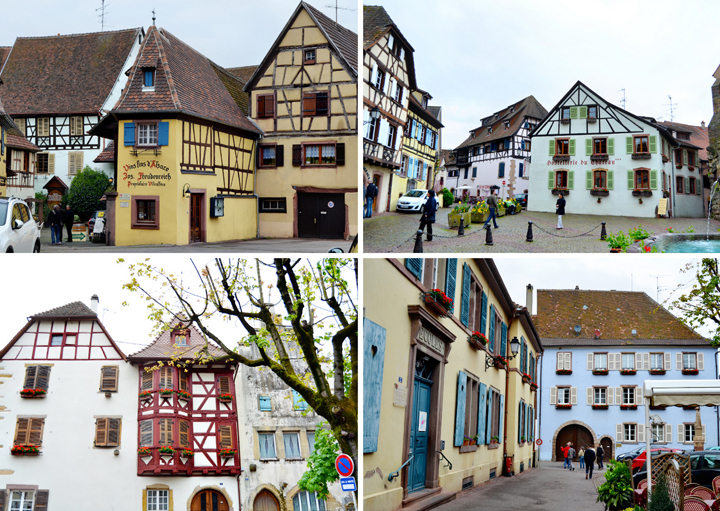 After our wonderful (and blessedly dry) morning in Colmar and lunch at the apartment, we drove south to our next stop: Eguisheim, France. This circular, flower festooned little wine town with a population of 1,600 is often overlooked by tourists. Although the town's defensive wall is gone, the Rue Des Remparts survives scenically circling the village. 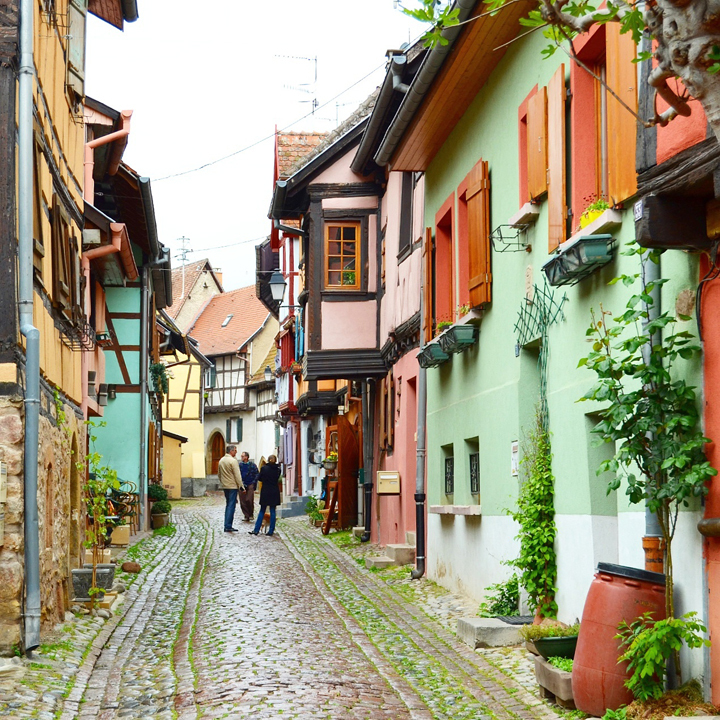 The main drag, the Grand Rue, bisects the circle leading to a town square that as darling as a fairy tale. It seemed like every stop on our trip one-upped the previous stop in cuteness. So I like doors. Sue me! Or don't. 'Preciate it. I told you I like doors. Higgledy-piggledy We slowly ambled the ovoid road all the way around the town feeling like an extra in Beauty and the Beast. 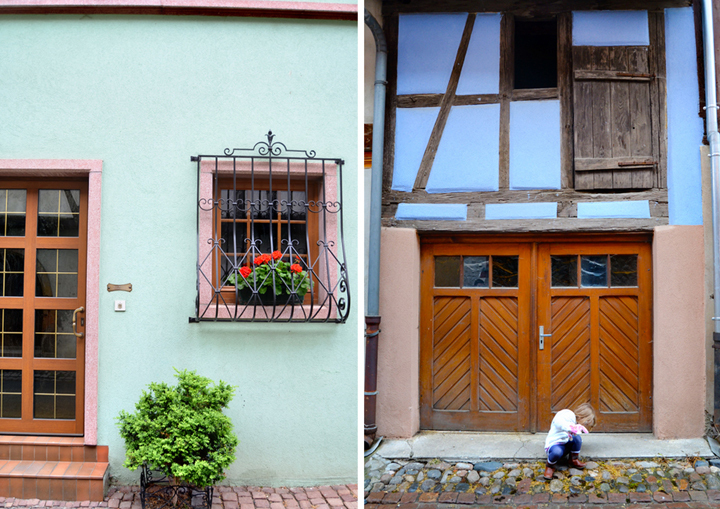 One of the symbols of the Alsace region is the stork. 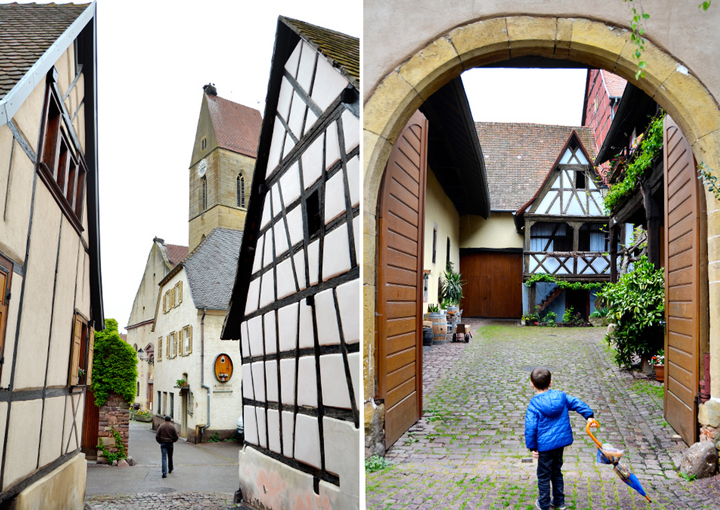 We saw them on magnets and postcoards galore, but we didn't actually see any until Eguisheim. They have HUGE nests perched precariously on peaked roofs, like the town church. The birds are the subject of numerous local legends and children's tales. The birds practically disappeared around 1970, but re-population efforts are continuing. 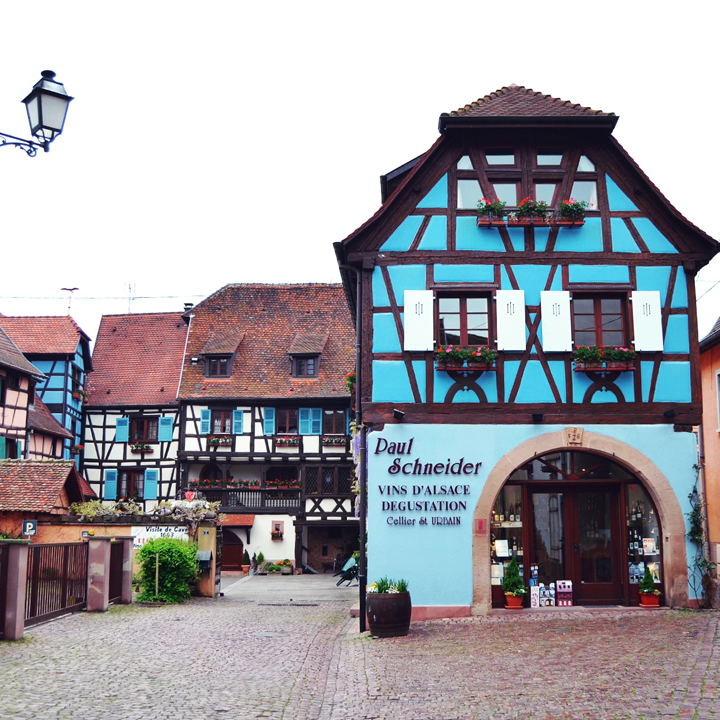 Another fun fact about Alsace is that the whole concept of an Easter Bunny originated here. The Easter Bunny was first mentioned in Georg Franck von Franckenau's De ovis paschalibus in 1682 referring to an Alsace tradition of an Easter Hare bringing Easter Eggs. Bright purple flowers against a mint green building. The town square. The mini-castle is privately owned and closed to the public. Surviving bits of its 13th century, eight-sided wall circle the chapel which is built in a Neo-Romanesque style. The 19th century fountain sports a statue of St. Leo IX, the only Alsatian pope and a native of Eguisheim. 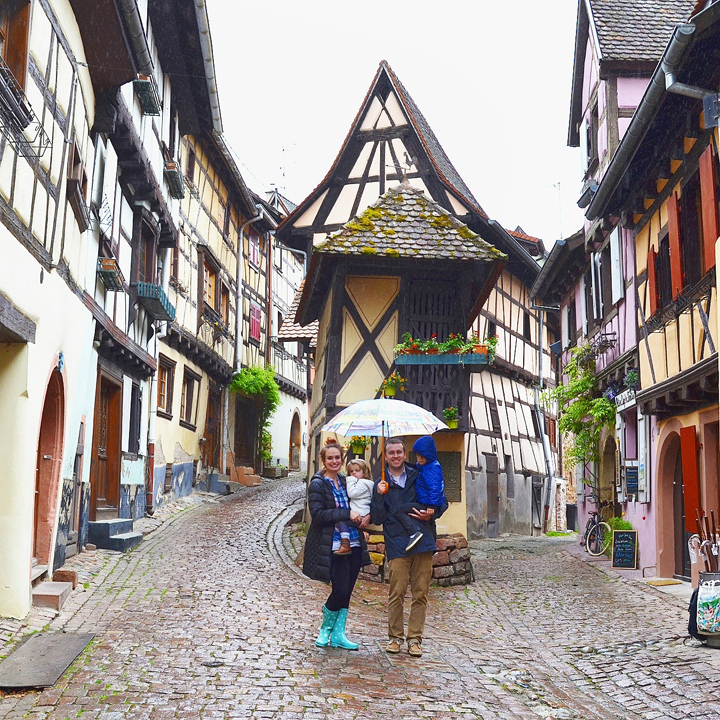 The Evans Family in Eguisheim, France on Saturday May 2, 2015. And that was the end of our Alsace, France trip! This'll be hard to beat in cuteness, that's for sure! Such a cute little town!!!! 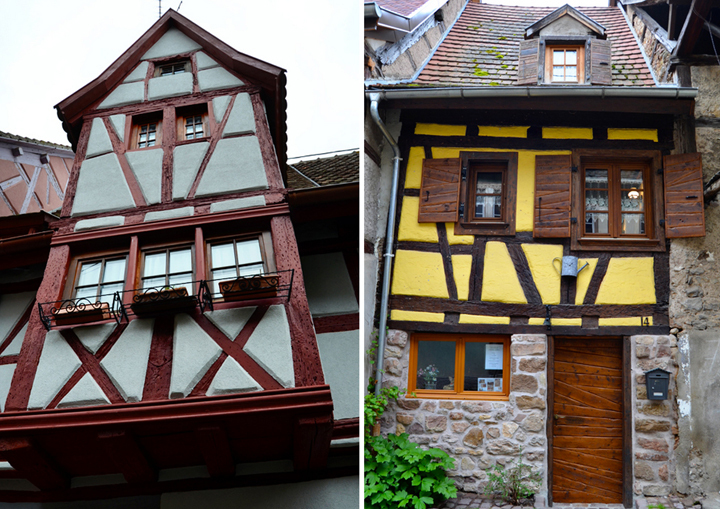 This reminds me of Germany with the half-timbered houses. thank you for the lovely tour! "There goes the baker with his bread like always!